Today is Time to Talk day. Once again the Time to Change campaign is encouraging people to take some time to break the silence that so often surrounds mental health problems and have a conversation with friends, family or colleagues. Or, in this case, the internet. 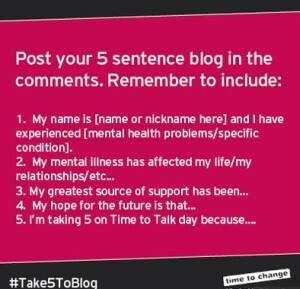 So here’s my 5 (ish) sentence blog. My name is Clare and I have experienced depression and anxiety. It’s made worse by my errant hormones. I’ve been on Citalopram since I was 17. I’m trying to come off them now but it’s HARD! I have stalled at the 10mg mark but will be reducing in tiny tiny instalments again soon (when I’m feeling strong and the spring sun starts to shine). My mental illness has affected my education – I had to repeat a year of university – and my relationships. Before Alex, pretty much all of my serious relationships ended because of my mental health. My greatest source of support has been my boy Alex. He also manages anxiety and that shared understanding helps us care for each other. I’m also lucky enough to have supportive friends and family, many of whom also experience mental health problems of their own and to whom I can talk openly. There were times when I couldn’t make sense of my experiences in my head or out loud and then my journals and writing kept me going. I wrote to them like a friend. I’m deeply aware of how fortunate I am to have the people around me I do. I’m thankful for them every day. My hope for the future is that everyone is able to find that network of support. A lot of the peer support work I do online is motivated by the desire to help people build that. I’m taking 5 on Time to Talk day because I’ve found that being open and sometimes vulnerable in the world helps others be the same to me. And if I can help someone take that very first step to seeking help, to feel the relief of sharing and normalising their experiences, I will. Every time. 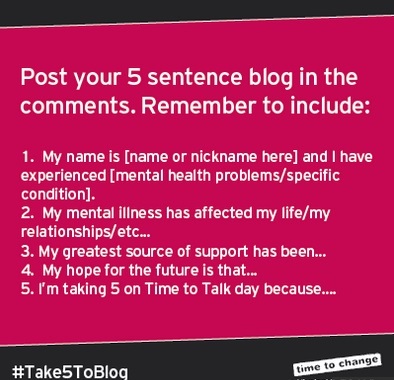 This entry was posted in All posts, Writing my mind and tagged Anxiety, Community Moderation, Depression, Mental Health, Online Support, Peer Support, Recovery, Relationships, Take 5, Time To Change on February 5, 2015 by fostress. Giles Coren just called mindfulness ‘cynical, capitalist, techno smegma’ in Time Out. Now while I know it’s not only Katie Hopkins who is paid to spout controversial and potentially damaging opinions and these things are usually best ignored, I still wanted to write something in reply. Since my Mindfulness Based Cognitive Therapy course in 2012, I have been an advocate for all things mindful. I read the book, ran a Mindfulness expert chat for TheSIte.org and explored how mindfulness influenced my life in all kinds of ways. And, when I could, I did the meditations. But I have to admit I fell off the wagon. I tried to cut down on my Citalopram throughout last year (I’ve stalled at 10mg). When I needed it most I stopped. I was coping with mood swings and anxiety. I found it hard to sit still. I was impatient and restless and irritable. I worried about everything I needed to fit into my day, going over and over my schedule in my head. I ran and ran. There were weeks where I only felt myself when running. Running is still the most no nonsense, immediate, endorphin loaded head-reset technique in my toolkit. I still couldn’t manage without it. But I realised I needed to revisit some of my other tools when I got to the point I felt I needed to run more than once a day to control the anxiety. And so I turned to Headspace. I needed a controlled reintroduction to mindfulness. And so far it’s been perfect. It starts with 10 minutes a day, moving up to 15 and then 20 minutes. Cartoons and explanations give you new ideas to think about every few days. It’s a reminder of the detailed theory I used to know. It’s reminded me to recognise thoughts for what they are, weather in the sky of my mind. Mental events that will pass and don’t always need attention. But it’s the actual meditative practice that has helped most. My depression and anxiety always get the better of me slowly. When my thoughts and attention are elsewhere, clouds gather above and sands shift beneath me. By the time I realise that things feel dark and cold, I’m no longer on solid ground. When it gets to this point it’s much harder to find my way back. Spending a short time meditating (almost) every day enables me to check in on my mood and make sure I can still find the clear sky of my mind behind whatever thoughts are gathering, storming or scudding that day. I’ve only been doing it 20 days or so and already it feels strange when I miss a day. And, Giles, having an app to help me do that has been great. The thing with mindfulness is that is is easy to disregard, especially for those people who are feeling negative anyway. It doesn’t always make sense immediately. You can’t see the benefit straight away. You need to give it time and keep practicing. An app helps people do that. It’s provided structure and helped me rediscover how mindfulness works bit by bit. When I press play and sit down, I can feel my breath slowing. That space is just mine until the time is up. So for those people who have given up on mindfulness because of Giles, give it another chance. It takes time but it is worth it. This entry was posted in All posts, Writing my mind and tagged Anxiety, apps, Depression, Headspace, Mindfulness on February 2, 2015 by fostress.